Overage winger Keeghan Howdeshell snapped a seven-game goal scoring drought, helping the Soo Greyhounds hold on to defeat visiting Niagara 7-6 despite a late scare. Howdeshell had two goals and an assist, setting up Jaromir Pytlik coming down the middle to open the scoring before potting a pair of his own on quick releases. Howdeshell’s 34th and 35th goals of the season helped power the Greyhounds to a 7-2 lead before the IceDogs charged back with four unanswered, coming up just short. Howdeshell has 58 points (35-23–58) through 52 games this season. The 20-year-old from Brighton, Mich. attended rookie camp with the Arizona Coyotes in September. 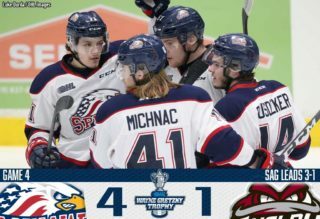 Florida Panthers prospect Owen Tippett starred in a thrilling 6-3 Saginaw Spirit victory over the visiting London Knights on Friday. 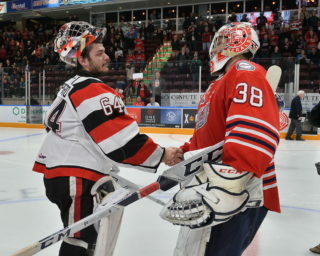 After going eight games without a goal, Tippett broke out with two on Friday including a third period penalty shot tally past London’s Jordan Kooy. The 19-year-old Peterborough, Ont. 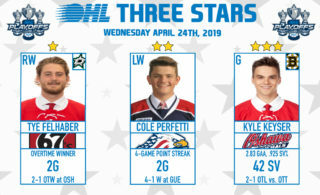 native had nine shots on goal and finished with a plus-3 rating as the Spirit earned their fourth straight win and remained within two points of first place in the West Division. 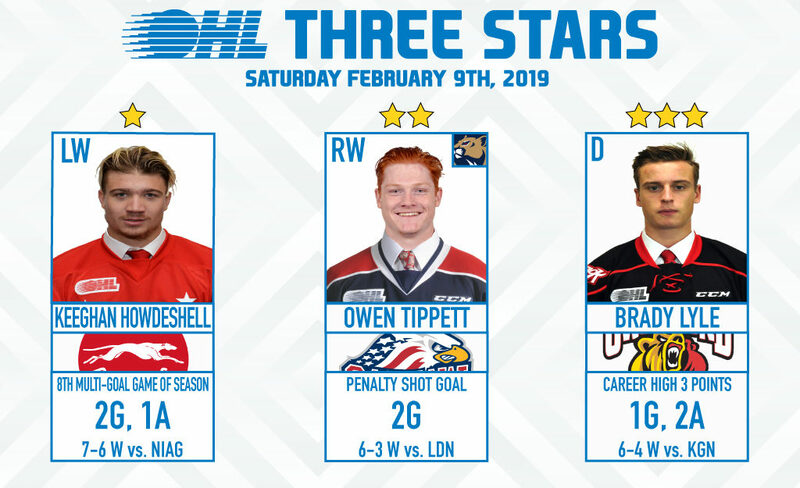 Tippett has 47 points (24-23–47) over 38 games between Saginaw and Mississauga this season. He recently represented Canada at the IIHF World Junior Hockey Championship in Vancouver, BC. Tippett was the 10th overall pick of the 2017 NHL Draft. 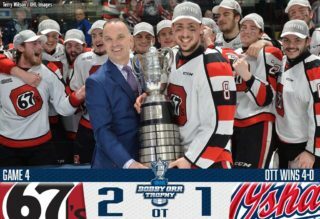 Owen Sound Attack defenceman Brady Lyle came up big in Friday’s 6-4 win over the visiting Kingston Frontenacs, setting up Aidan Dudas for the game winning goal midway through the third period. Lyle finished the night with a career high three points, netting a goal while adding two assists. Lyle scored his ninth of the season on a seeing-eye point wrister early in the second period. The 19-year-old product of North Bay, Ont. has 30 points (9-21–30) over 53 games in this, his fourth OHL season. Lyle was originally North Bay’s first round pick in the 2015 OHL Priority Selection. He attended rookie camp with the Ottawa Senators in September.